After a grizzly-bear poacher named Hanaghan kills her fiance and fellow Fish & Wildlife Deptartment officer, Julie Clayton sets out to track the killer down and discover why the FBI is keeping its case secret from her. She is joined in her quest by Rollins, a police detective fresh out of alcohol-dependency rehabilitation. The forest rangers Julie Clayton and her boyfriend Don Powell find several grizzly-bear slaughtered in the forest. They report to their superior and he comes with the FBI Agent Eric Ashton and his partner and other rangers. They team-up and go to the wilderness by helicopter to seek out the poacher. However, the man kills the rangers and the FBI agent and Julie is seriously wounded. She miraculously survives and learns that her beloved Don was murdered. Julie is deeply affected but when she meets the alcoholic police detective Nick Rollins, he motivates her to live with hate planning revenge. Meanwhile the FBI decides to use Julie as bait to catch the poacher Hanaghan. But Hanaghan has developed a weird attraction for Julie. On the surface, this is like the hundreds of other movies I've seen. There's a psychotic killer who kills the partner/sibling/best friend/S.O. of the main hero who then avenges his/her death. But this is not one of those films. This is different. Granted, the main plot is familiar. Julie and Don are living in the wilderness tracking bears when a poacher kills Don and almost does the same to Julie. With extraordinary luck, she survives but has lost her will to live. The poacher, however, is a well-paid professional hunter who has no plans to leave any witnesses alive so when Julie is sent to the city to recover, he follows her to finish what he started. Meanwhile, a suicidal Julie must find a will to live with some help from an alcoholic cop, Rollins. So that's the setting. Sounds simple? It is. On paper. But surprisingly enough, not in the movie. You see, the film is NOT just a revenge action-thriller. It's more of a character study. In a "normal" film, the death of a friend would cause the hero to grieve for about 30 seconds (possibly accompanied later by a few flashback-scenes). In this film, the main thing is Julie's recovery - especially mentally. The objective is to show what Julie goes through after the death of the only person she cared about. Revenge is not a clear course of action. It's not something this film takes lightly. But as things move along, it comes apparent that the officials can't help and she can't start a new life until the nightmares of the old one has been taken care of. It's important to notice that the setting and the characters really aren't as black and white as the basic plot would have you believe. Julie doesn't go from happy to sad to happy again at the flick of a switch. She knows that even if she gets her revenge, things will never be the same but has decided to cross that bridge once she gets there. For now, revenge provides her the strength to move on. Also, Rollins is a flawed character who has some skeletons in the closet but still has found a will to live  he's not a generic loose cannon. Technically, the movie is very low-key. There are no explosions, no big chases, nothing like that. Still, the film was never boring to me. Everything was there for a purpose. The production values are flawless, rivalling those of big budget theatrical releases. Lots of beautiful scenery shots, nice editing, brilliant directing. The score by Ross Vannelli is excellent, including beautiful, atmospheric and aggressive moments. I'd buy it in an instant but of course it isn't available. And this is probably only the second film I've seen where you actually can randomly use freeze frame and at least 9 times out of 10 you'd see a beautifully composed shot which wouldn't look out of place in a lobby card (the other film is "American Dragons/Double Edge", a Michael Biehn-actioner directed by Ralph Hemecker which was also elevated above it's standard material because of some unique stylistic touches). If you allow it, this movie raises some interesting questions. What would you do in a similar situation? Revenge won't bring your life back but could you ever find the balance if you knew that the man who ruined your life is out there? Is the character in a true no-win situation? If the only person you cared about would be murdered and you had the opportunity to either kill the murderer or to walk away knowing that the case would soon be forgotten by everyone but you and you'd never see the murderer brought to justice? After I had watched the film a few times, I realized that there really should be an instruction manual with films like these indicating who it's for and the best way to watch the film. I don't know if the filmmakers would agree with me, but in my opinion if you just keep it in the background or watch it with some friends over pop corn, it'll never work. You only want to see action? Forget it. You're the type of person who always watches films with friends, talking while watching them and making fun of them in MST3K-style? Don't see this one. But if you like reading dark novels, staying up late at night listening to the rain while doing nothing but thinking, this is the one to watch. Open-minded, emotional people will like this. I have to mention that I still adore those straightforward revenge-actioners where a flawless martial arts-hero kills everyone in sight in the most violent way imaginable without ever getting hurt himself and which you forget 5 seconds after the movie is over (coincidentally director Richard Martin has also directed `White Tiger' which is a great example of that kind of a film). 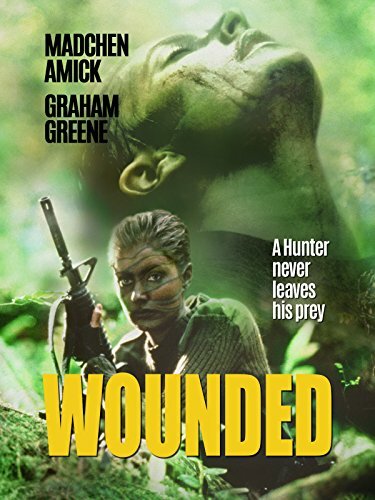 But "Wounded" is a more ambitious film and one which succeeds in everything it sets out to do - and that's no small feat! Highly recommended. This is a fairly good movie that doesn't try to overwhelm the viewers with non-stop action, chase scenes and loud, hysterical goings on. However, I do feel that the movie would have been better with a little more action and sharper dialog. For much of the time, the dialog was spoken so softly that I had to keep turning up the volume on my TV just to be able to hear what the characters were saying. The finale, where the protagonist and antagonist meet to resolve the issue is just as low key as the rest of the movie.